Grace Williams is eleven years old and a top ranked gymnast in Ontario. 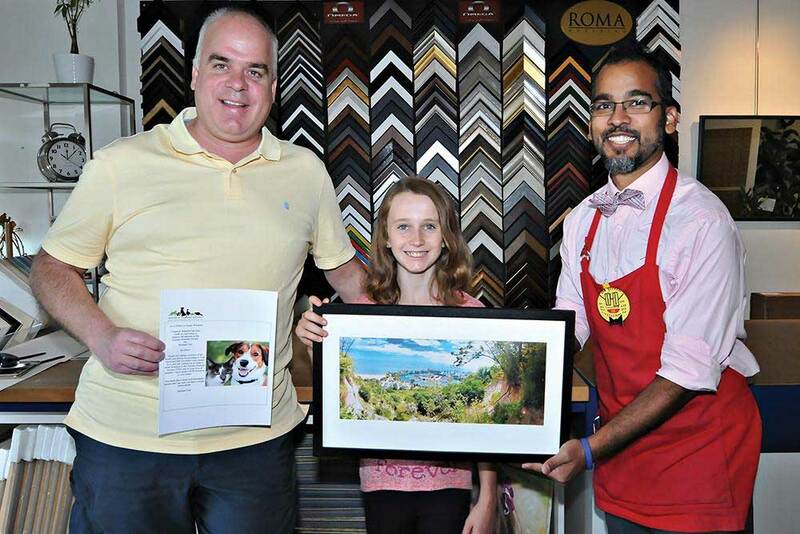 When she turned seven she asked not to receive presents for her birthday, rather to have funds directed to the Humane Society – so her father, delivered $300 to help the Society and the animals. Recently, while walking her dog, she decided to take a picture of what she sees all the time – the view of the Brimley basin on top of the Bluffs. Her father Martin, a local entrepreneur who owns a company called Nutrilawn, was so impressed he posted the photo on social media. Michael Carr a local Remax Realtor saw it and reached out to the family and offered to purchase the photo from Grace to use in a brochure. Grace declined accepting money but suggested that a contribution to the Toronto Humane Society would make her very happy. Michael did that and Grace received a thank you certificate from the Humane Society for the contribution. I mentioned that to my good friend Rabi Alam who owns another local business called ASAP – they provide design, printing,, mailboxes and now framing. I depend on him all the time. He, in turn, offered to matt and frame the photo and give it to the family for free. It was truly a win / win scenario for all concerned.